I was speaking with a camp last week about their marketing and promotional efforts. They are a traditional overnight camp in the Northeast that is struggling a bit to fill sessions that in the past were at capacity by this time of year. I asked them about social media and their answer was “We don’t do Facebook.” In an effort to understand better why a camp wouldn’t be using free media outlets such as facebook and twitter to share their story I pushed on, Why not? Had you in the past? Do you have a personal Facebook page? It turned out for this camp they had put Facebook and Twitter in the “fad” category and were not sure it was going to stick around so why bother investing the time necessary to learning what is needed to get started. There are more than 500 Million active users on Facebook. The average user has over 130 Friends. One of fastest growing groups on Facebook are mothers. No one knows if Facebook will be around forever but for now it sure looks to be a great place start a network to share your camps story. Here is a link that will walk you though the step by step process needed to get started on Facebook. Here’s to a great camp season! 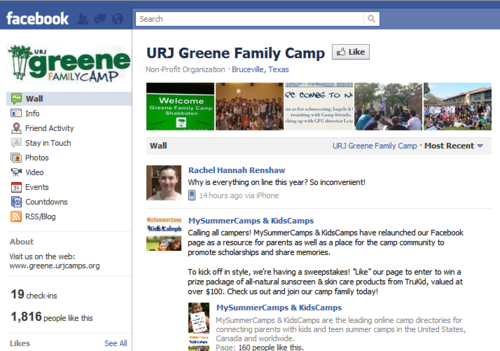 This entry was posted in Uncategorized and tagged Camp Promotion, Social media by admin. Bookmark the permalink. Is Facebook Live Right for You? How can the blockbuster hit “The Hunger Games” help summer camps?